This LED ring light is specially designed for macro photography. 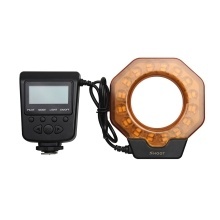 GN15, 6800K color temperature and 8 levels of adjustable brightness, it can be used as a ring flash and a fill-in light. As a ring flash, supports circular/ left/ right flash modes which makes your photography more professional. Equipped with universal hot shoe, it is suitable for Canon/ Nikon/ Pentax/ Olympus/ Panasonic DSLR cameras, etc. LED ring flash/ fill-in light designed for macro photography. With ultra bright LED beads and 6800K color temperature, offers you more natural light. supports circular-flash/ left-flash/ right-flash modes & illumination mode. 8 levels of adjustable brightness, meeting your different needs of light. Universal hot shoe design, suitable for Canon Nikon Pentax Olympus Panasonic DSLR cameras & etc. With LCD display for easy and accurate operation. Comes with an orange ring filter and 8pcs adapter rings of different diameters. Camera Compatibility: For Canon Nikon Pentax Olympus Panasonic DSLR & etc. Batteries and camera are not included.